Using bowden support and adapter ring. Makes upgrading to an E3D much simpler; Thank you! The left cover looks good, but I already had a split one installed so just removed the right half. Well done. Now that you've had it a couple of months, how do you like running the I3 Mega with the V6 hotend? I melted the end of the PTFE tubing in the AnyCubic hotend using PETG at 250+, so the V6 solves that at least. As for anything else, it seems to be working well, but i didn't have enough experience before to make any comparisons other than the all-metal vs PTFE insert one. If you want to print anything higher than 240, maybe 245, the PTFE lined hotends that came with the printer just don't cut it. Thanks for the quick reply. I'm a bit of a novice at this point, too. 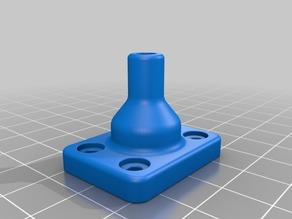 I want to try a bit of eSun nylon and am hoping this new hotend will bring that within reach. I've used Solutech's PETG of late and it performs well in the OEM V5 hotend as it prints at 220. Anyway, my V6 hotend is on the way. I'm looking forward to trying it out. I was a bit concerned with the thermistor for the v6 because most sites say you have to modify your firmware to the correct thermistor value and I have no idea how to do that for the mega. After I had everything except the bowden hooked up, I dropped a thermo-sensor down the throat and monitored it on an external meter as it heated up. My meter readings were within 0.5C of the temp the mega reported from 190 to 260, which is close enough for me. Changing the thermistor setting in firmware suggested by the E3D install instructions is different than PID tuning. It's telling the firmware what type of thermistor is being used whereas PID tuning is training the firmware to be able to level out heating cycles to keep the temperatures as constant as possible. Since we cannot modify the AnyCubic firmware easily, I used a standalone sensor inserted down the throat of the hotend connected to an external tester to check the accuracy after I had run PID tuning. The results were sufficiently close that I trust the Anycubic displayed temp to be within 1 degree of actual across the range of temperatures that I use.